With cold fronts coming to Fort Lauderdale almost weekly, charter fishing turns to Sailfish for action this time of year. One of our frequent fliers, Greg (no pun intended), brought Bob and Steve for a Sunday morning charter fishing trip for just this purpose. It?s always nice when a plan comes together. ? With Goggle Eyes ordered a few days earlier to make sure live bait was had, the boys were off early on their quest with Captain Tom at the helm and our ever ready mate Andrew controlling the pit. The kites were launched, the baits loaded and they began their day in hopes of being in the right depth for any passing Sails to be attracted to an early breakfast. As I was not on board, I can?t say completely how things went but I do know that it was a slow start. I spoke to Tom around 9 and they hadn?t seen or caught anything at that point. And when you have someone like Greg aboard, who has been multiple times, you always want to produce. Conditions were perfect! Cold air had passed, the bite should be on! This is what WE told him! 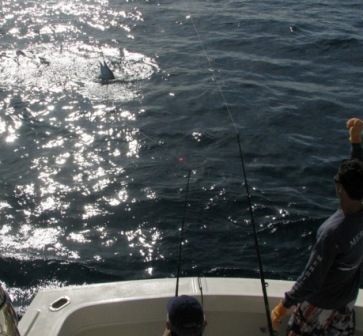 As it turned out, Greg and Bob did catch Sailfish and Steve caught a nice King from the kite. Smiles were had all around and it was mere moments that pictures were posted on Facebook. The picture I chose for this blog was one taken toward the end of one of the battles? Only the head of the fish can be seen out of the water. This happens toward the end because the fish is getting tired and doesn?t have the strength to jump completely and clear the ocean. It makes them easier to handle next to the boat. Trying to ?bill? a green or lively fish next to the boat can not only hurt the fish but the mate as well. Wearing them down makes the capture and release less strain on them. A few quick pictures and then the sometimes lengthy revival of resuscitating them by dragging them through the water. This helps the water pass over and through their gills allowing oxygen to be processed into the body. It?s something we take pride in doing. ? Congratulations to all aboard for a great and successful trip charter fishing for Sailfish in Fort Lauderdale.